Sydney Harbour, NSW: This list was compiled in 2006. The updated 2011 Edition can be found here. Sure, you should “do” Sydney Harbour before you die. The problem is how. Sydneysiders have been inventing new ways to do the Harbour for years: you can cruise on it, power boat on it, sail it, swim it, sit by it, canoe it, fish on it, eat on it, dance on it, drive over it, drive under it, fly past it, sit on an island in it, view it from the zoo . . . the list goes on and on. It’s also become increasingly possible to walk around the Harbour: the 28km of tracks, many through national parks and along beaches, form the Harbour Circle Walk, covering points of historic and natural interest, and of course, hundreds of spectacular vantage points. 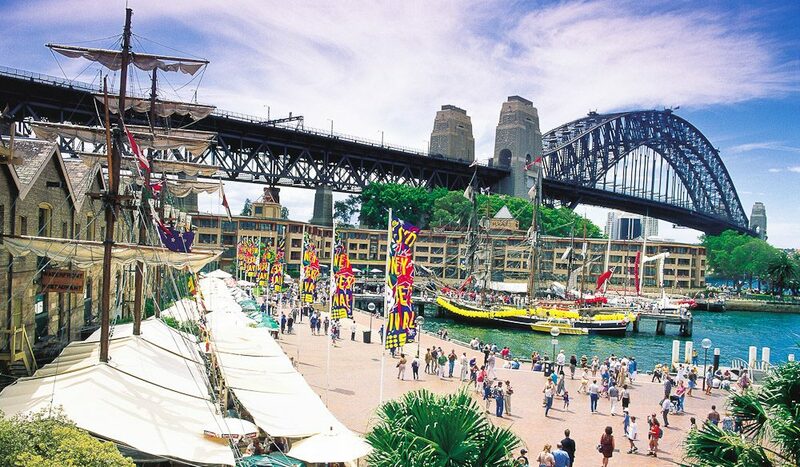 There are many historic sites around the Harbour, such as The Rocks under the Bridge in Sydney Cove, the site of Old Sydney Town. Ancient grain stores and customs houses are now restaurants, shops and art galleries. The Rocks Market is (along with the Paddington Markets) one of the city’s best for art. And if your schedule permits, between Christmas and New Year is an ideal time to do the Harbour. On Boxing Day the Sydney to Hobart yacht race begins, a remarkable sight. On New Year’s Eve, the water hosts the world’s largest annual fireworks display. Not to be missed. Sydney Harbour boasts not one, but two excellent aquariums – the Sydney Aquarium at Darling Harbour, and Oceanworld in Manly. We’re going to the zoo. Take the ferry and the kids to Taronga Zoo – even the zoo in Sydney is all about location, location, location. Watch the Sydney New Year’s Eve Fireworks. Marvel at the world’s largest annual fireworks display as it happens in Sydney on New Years Eve. 31 December, 9pm and Midnight. Cruise the harbour. There are many operators, offering everything from short cruises to exciting dinner dances. And don’t forget good old Sydney Ferries who have some excellent tours around the Harbour. Watch the Sydney to Hobart yacht race begin. On Boxing Day, every year. Grab a spot on a headland anywhere in the harbour, bring a picnic, and enjoy the boats streaming out of the Harbour. Take in the icons and walk the newly-opened 28km route around Sydney Harbour with the new Harbour Circle Walk. Visit the Rocks. Restaurants, pubs, shops, art galleries, and a great market on Saturdays. Visit the NSW Contemporary Art Museum. Don’t forget Darling Harbour. Just next door, with the Maritime Museum and the Sydney Aquarium. Er, you can’t miss it. All year round. But Boxing Day and New Year’s Eve are particularly special. For the Sydney Harbour Walk.